I have forgotten my makeup bag on a press trip only once. It's important to mention this because once was all it took. I found myself in the airport, reaching for my toiletries to take out for security screening and it dawned on me that there was no bag because it was still sitting on my bathroom sink. All by itself it sat, resting and shaking it's imaginary finger in my general direction and saying, in a rather disappointed voice, "we knew this would happen eventually. "And there it was... happening. But, I firmly believe that when one door closes in this crazy universe, it allows another to open. And this is where my new insane obsession with shopping airports has officially taken a new turn - towards beauty. So there I am wondering where to start. Where do I turn? My gut told me to go straight to the pharmacy and buy a bunch of cheap and cheerful products that will do the trick for a weekend away. That's everyone's first thought, right? And yes, that was mine. Slap me. I did do just that and bought a whole load of products, some on sale, some on offer and others that were just downright too cheap to believe it. Well, all things come with a consequence and this sad story ends with me, two days later, taking a plane back to London with a face that was as red as a bright tomato. There's a reason we all develop beauty routines we trust. Now, bear with me as I am going somewhere with all of this. After telling my story a thousand times over to PRs and friends alike, one PR brought to my attention the great deals that actually exist in the airport for just such a reason. Apparently, there are all kinds of deals and steals with GREAT and REPUTABLE makeup, skincare and haircare brands to be found at the airport. Now, I have to say that my knowledge starts and stops with Heathrow airport at this point. But, for those of you travelling through Heathrow in the near future, I wanted to give you a formal introduction to just such a deal and steal that I've fallen head over heels in love with. 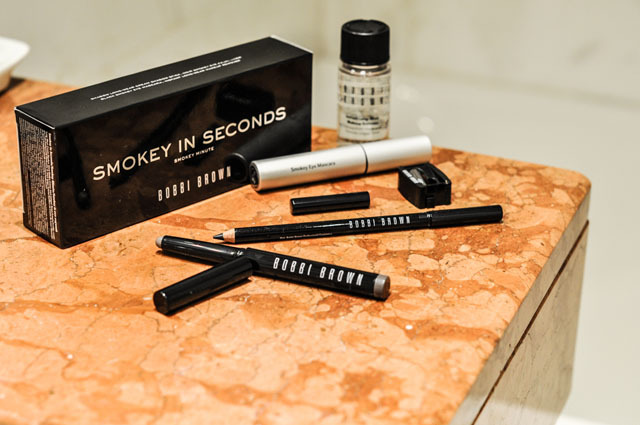 Enter Bobbi Brown's Smokey in Seconds. This is a chic little kit, which comes in a perfectly pint sized black box, that has every ingredient needed to give you the perfect smokey eye. According to Bobbi Brown, the Smokey Eye is the most requested makeup look. The famed makeup artist says, "It's the quickest way to instantly dress up eyes. It may look complicated, but with the right products and tools, it's easy and quick to create the look you want." 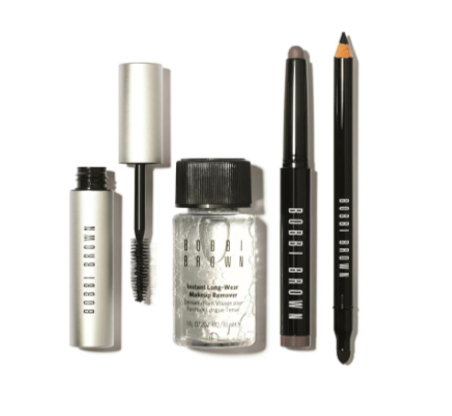 And Bobbi Brown gives you absolutely everything you are going to need in her Smokey in Seconds kit. 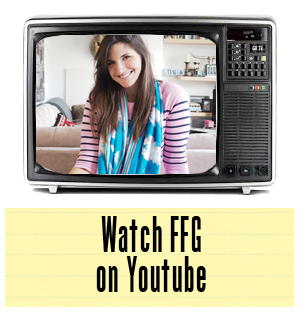 Now, if you're like me (a total makeup dummy), this is music to your ears. And if you have a bit of a commitment issue to makeup, you'll also love that everything is more or less travel and trial size. It fits perfectly in your carry on and it really is the best thing since sliced bread when you're having a makeup emergency. It's £40, with a retail value of over £60, and it's available to buy at your Bobbi Brown airport concession. If you love, you go and buy the full size to keep at home forever and amen. If you feel like you could do better, you go back to the drawing board. I think after using this kit you'll find yourself visiting your local Bobbi Brown. I did.